it is with both sadness and joy that Rubi (aka Classic Kitten) has been retired to stud. A stable favourite amongst the staff, Rubi was always a kind-hearted mare with an excellent temperament and a delight to handle. By champion American stallion Kitten’s Joy out of American mare Classic Quest, Rubi was beautifully bred and picked up many of the physical traits her sire passed on. With excellent size, strength and attitude, Rubi was one of the most distinctive horses in the stable from the day she arrived. Owned and raced by long-term client Jammie Dillon, Rubi will be served in the upcoming season by first season sire War at Blue Gum Farm. Coming from an excellent North American bloodline, Rubi is a mare that Tony has rated highly. “She’s a beautiful mare with a lovely action and I expect her to throw good stock,” said Tony. 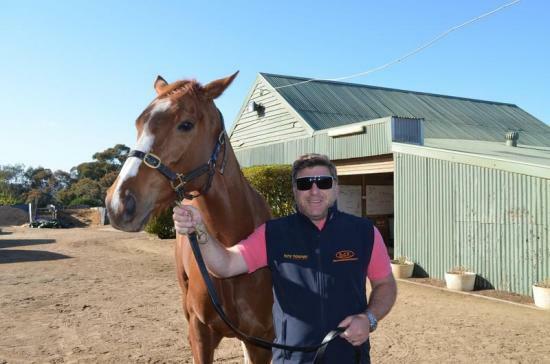 Prior to confirming her retirement, Tony and Jammie put Rubi through a Brain analysis with Australian sires and were delighted with the results returned. Rubi has now arrived safely at Blue Gum Farm and the entire team at Tony Noonan Racing wish her the best of luck in retirement and look forward to seeing her progeny.